What is the most effective way to remove rust from concrete? Our Concrete Rust Remover is the best product available for removing rust from concrete, masonry, and stone. It is not hazardous and will not harm grass or vegetation when used on driveways, sidewalks, etc. On what surfaces can you use the Concrete Rust Remover? 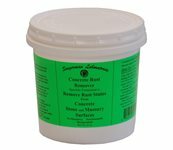 Concrete Rust Remover is ideal for use on basement floors, walkways, driveways, garage floors, stone or concrete walls, steps, bridges, paver blocks, and similar surfaces. I have severe rust stains on my driveway caused by water from my untreated sprinkler system. Will the Concrete Rust Remover be effective on this type of stain? Absolutely. Rust stains from a sprinkler are one of the most common type of rust stains for which we recommend the Concrete Rust Remover. Most stains will be removed in 15 minutes. If your stain is more severe, we recommend leaving the product on for 30-60 minutes. For the most stubborn rust stains, you might need to rinse off after an hour and apply a second coat. If needed, apply a little brushing action to hasten removal of the stain. I have rust spots on my sidewalk that were caused by my fertilizer. Will Concrete Rust Remover work for me? 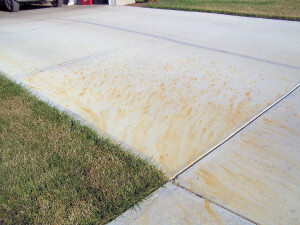 Yes, rust stains caused by the iron in some fertilizers are the cause of many stained driveways, patios, and sidewalks. Our Concrete Rust Remover will be an effective solution for those ugly stains. Simply follow the directions and your concrete will be looking good in no time. I have rust stains on my driveway but it wasn't caused by fertilizer, will it still work for me? While fertilizer is a common reason for rust stains on concrete, it is by no means the only cause of rust stains. Our product works on rust stains on concrete, regardless of the reason for the rust stain. Will the Concrete Rust Remover harm my grass or plants? No, our Concrete Rust Remover will not harm grass or vegetation. Will it remove battery acids stains from concrete? Concrete Rust Remover is an effective way to remove stains left by battery acid on concrete. This is a common problem that occurs when batteries from golf carts or other vehicles leak. It may take a little extra scrubbing, but the stains will be removed. How do I remove the Concrete Rust Remover once it is applied? Simply rinse off the area completely with water when you're finished. For outside jobs, we recommend that you use a hose to rinse the area. 1. Clean any dirt or debris from the surface to be treated. 2. Add the Concrete Rust Remover powder concentrate to water as directed on the label to form a gel. A 22-oz. container mixes with one gallon of water, but smaller batches can be made at a ratio of three tablespoons of powder per cup of water. 3. Immediately spread the gel generously on the rust stain. We recommend using a paint or scrub brush to apply. 4. Let stand for fifteen minutes or longer, depending on the severity of the stain. Simply hose away with a forceful stream of water when the stains are removed. See the photos below. Ugly rust stains on the driveway from fertilizer containing iron. After using Concrete Rust Remover the area looks good again! In what sizes is the Concrete Rust Remover available? Concrete Rust Remover is sold in 22-oz. pails or 60-lb. drums. How big of an area will the 22 oz. pail cover when it's mixed? What about the larger drum? The 22-oz. pail will cover approximately 60 square feet and the 60-lb. drum is enough to cover approximately 2600 square feet. Do I have to mix up the whole batch at one time? No, only mix as much as is needed. A 22-oz. pail should be mixed with one gallon of water, but if you need smaller batches, they can be made at a ratio of three tablespoons of powder per cup of water. How long does the Concrete Rust Remover last after it's been mixed? The mixed solution will lose its rust removing ability over time. It loses about half its effectiveness in four hours so only mix up as much product as you'll be using at the time. The remaining powder concentrate will remain stable when stored in its container. Can Concrete Rust Remover be used on a new driveway? Yes, if your concrete is at least one month old. However, as with any type of chemical, we always recommend testing the product in a small area first. I have a colored concrete patio, will the Concrete Rust Remover work for me? Yes, we have had several satisfied customers that have used it on colored concrete. Again, as with any type of chemical, we always recommend testing the product in a small area first. How long does the Concrete Rust Remover take to work? In most cases the product will remove all the rust stains in about 15 minutes, but if the stain is more severe you might need to leave it on longer. For the most stubborn rust stains, you might need to rinse off after an hour and apply a second coat. If needed, apply a little brushing action to hasten removal of the stain. In what form is the Concrete Rust Remover sold? Concrete Rust Remover is sold in a powder concentrate. You simply need to mix it with water. I've heard that I can use muriatic acid to remove rust stains on concrete. Is muriatic acid an effective rust remover? While muriatic acid is readily available in most hardware stores and home centers and is often suggested as an effective way to remove rust from concrete, it is NOT a method that we recommend. 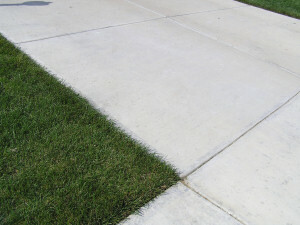 Not only is it a very strong and hazardous acid, but it is often harmful to the concrete. Muriatic acid is used to etch concrete and often leaves the concrete rough and damaged as it actually removes the concrete. Muriatic acid is a highly reactive liquid acid and it is extremely dangerous. It is also known as hydrochloric acid. Many times use of muriatic acid will remove the rust stain in some cases, but it will create another problem of etched concrete (we know this because people call us with this problem). Our Concrete Rust Remover does NOT contain muriatic acid, and will NOT etch or damage the concrete in any way. Are there any cautions that I should be aware of when using the product? It is an eye and skin irritant, so avoid contact with eyes and skin. You might consider wearing protective gloves and eyewear. If it contacts skin or eyes, flush with lots of running water. If swallowed, wash out mouth with water and seek medical attention immediately. Wear old clothes. Product will remove color from fabric. Use in a well-ventilated area. What will the surface look like when the rust is removed? In the vast majority of cases, your surface will be free of rust and look like the surrounding concrete. In some cases, the properties of the product may lighten the concrete. If this is a concern, we do suggest testing a small batch first. Is there a minimum temperature at which the concrete rust remover can be used? We do not recommend using concrete rust remover below 45 degrees. What is the shelf life of Concrete Rust Remover? We rotate our stock so you can always be assured of receiving very fresh product. We recommend using it within a season. If kept sealed and unopened it can last longer. It is a moisture curing product, so over time moisture can get into the container and cause the product to lose its effectiveness.